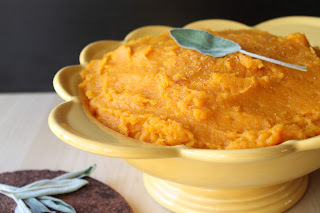 For me, very few foods signify autumn and the beginning of the holiday season as much as butternut squash. Winter squashes, of which butternut is one, are inextricably linked with Thanksgiving because they were one of the foods that kept the Pilgrims alive. The Settlers were first introduced to squashes by the Native Americans they befriended. 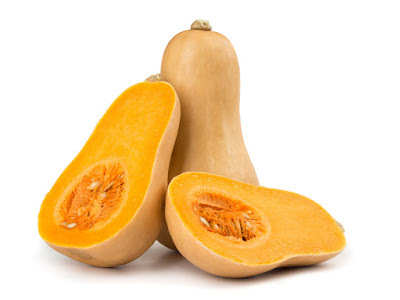 The word squash comes from the Narraganset Indian word asquutasquash (which was the word for a specific type of melon that is similar in appearance to some squashes). The Iroquois called squash, beans, and corn the 3 life-sustaining sisters, so important were these foods to their survival. Vitamin C. Butternut squash is a vitamin C-rich food. It boosts immunity, antibodies, and white blood cell activity. Vitamin C is important during times of stress. Beta-Carotene/Vitamin A. Loaded with beta-carotene, which the body can convert to vitamin A, butternuts are a potent cancer-fighting food. Carotenoids increase T-cells and antibody response. And, like other squashes, butternuts develop more beta-carotene over time. The levels of vitamin A make butternuts a good choice to maintain healthy skin and eyes and to fight infections (vitamin A keeps cell membranes healthy, making them stronger against disease-causing microorganisms). According to Jean Carper, author of Food—Your Miracle Medicine, squash, in general, is shown to lower risk of stomach cancer. It has also been shown to help fight breast cancer, which is the second biggest cancer in women next to lung cancer. The American Institute for Cancer Research (AICR) reports that an estimates 33 to 50 percent of breast cancer could possibly be prevented by practicing healthy eating habits and lifestyle throughout life. Magnesium. Butternuts and other squashes are high in magnesium—approximately 300 mg. in 1 cup mashed squash. An increase in magnesium has been shown to increase energy and help relieve depression, anxiety, panic attacks, insomnia, dizziness, and chronic headaches. Because it is high in magnesium, butternut is considered a therapeutic post-stroke food. Potassium. Butternuts are a rich source of potassium, which is important for the regulation of water balance and acid levels, energy metabolism, for the synthesis of protein from amino acids, and for proper muscle growth. Also...Squash is one of the first solids well tolerated by infants. 1. Breast cancer. As I mentioned above, high beta-carotene foods help fight this terrible killer. 2. Menorrhagia (abnormally heavy menstruation). One cause of this is a vitamin A deficiency. 3. Abnormal pap smears. Women who have had abnormal pap smears have shown to have low levels of beta-carotene and vitamin A (as well as vitamins E and C). 4. Premenstrual Syndrome. Vitamin A increases progesterone levels, and progesterone is believed to relieve PMS symptoms. 5. Vaginitis. Because of beta-carotene's and vitamin A's immunity-boosting, antiviral, and antibacterial properties, butternuts help fight off some types of vaginitis. 6. Urinary Tract Infections. Again, vitamin A is helpful for infection control. 7. Osteoporosis. 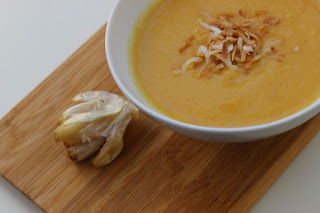 The phytochemicals in butternuts are a great way to fight against this disease—which affects older women, in particular—and results in decreased bone mass. Choose butternuts that are fully ripe. Butternuts should be a pretty even straw color all over; too much green indicates that the squash is not fully ripe. They should be firm and heavy for their size. Avoid any that have soft spots, slime, mold on the root or stem, or cracks. 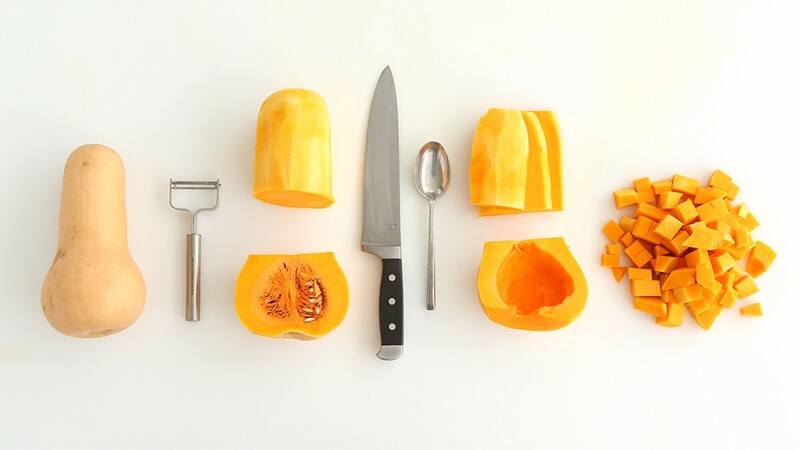 Butternuts are difficult to cut, but a vegetable peeler or a very sharp knife goes a long way. Be very careful of your fingers and do not point knives toward you—it is very easy to lose control when cutting winter squashes. If a recipe calls for cooked pulp, your best bet is to cut the squash in half lengthwise, steam it, and then just scoop the pulp out. The strings and seeds must be separated from the flesh and discarded. Winter squashes have a very long shelf life. Stored in a cool, dark place (such as a vegetable bin), butternuts can last as long as several months. Below are a couple recipes. Have a happy, healthy, joyous holiday season and enjoy! 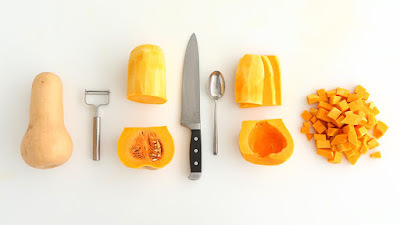 With a vegetable peeler or paring knife peel squash. 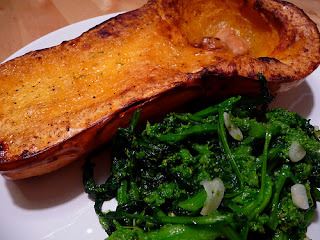 Cut squash and onion into 1/4-inch dice and cut broccoli rabe into ½-inch pieces. In a 12-inch nonstick skillet heat oil over moderately high heat until hot but not smoking and add vegetables and salt to taste, stirring to coat with oil. Add water and cook vegetables, covered, over moderate heat 5 minutes, or until tender. Remove lid and cook vegetables over moderately high heat, stirring occasionally, until liquid is evaporated and vegetables begin to brown, about 3 minutes more. Preheat oven to 350°F. Rub cut surfaces of garlic with oil. Put halves back together to reassemble heads. Wrap each tightly in foil; bake until tender, about 40 minutes. Cool garlic in foil. Melt butter in heavy large pot over medium heat. Add onions, carrots and celery; sauté until onions are beginning to soften, about 5 minutes. Add squash, broth and 2 tablespoons sage. Bring to boil. Reduce heat; simmer uncovered until squash is tender, about 25 minutes. Stir garlic into soup. Working in batches, purée soup in blender until smooth. Return to pot. (Can be made 1 day ahead. Refrigerate uncovered until cold. Cover and keep refrigerated. Bring to simmer before continuing.) Stir in ½ cup cream. Season to taste with salt and pepper. Transfer soup to tureen. Drizzle with remaining 1 tablespoon cream. Sprinkle with remaining 1 tablespoon sage.